Did Life on Earth Begin with Autocells? Convection caused by heating will generate a pattern of hexagons in a thin film of oil, showing that order can be brought to a system. The origin of life on Earth is still a hotly-debated topic. There are many different theories on how life was kick-started, as well as various experiments underway attempting to understand the processes involved. For example, a reverse engineering approach can be used by stripping away cells until the simplest possible system is left. However, evolution has ultimately hampered our understanding of life's origins as it has washed away the traces of the first forms of life, making it impossible to retrace life's early steps. This means that even the simple systems left after the reverse engineering approach are still too complicated to bear a resemblance to the first forms of life. A microtubule in a cell is an example where something in life is created spontaneously with self assembly. A tricky challenge that must be overcome before life can form is that order must be generated. However, this is not as simple as it sounds because the laws of physics state that things will naturally descend into a state of disorder. For example, a book placed precariously on the edge of a shelf will probably fall — thus creating disorder — but it is highly unlikely to create order by picking itself up again. Order can still be created locally, even when the overall system tends to go towards disorder. 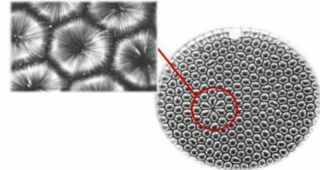 Pushing heat through a system can organize it, for example a regular pattern of hexagons is created when a thin layer of oil is heated evenly to form Benard convection cells. "If you heat something up and it gets regularized, what it's doing is it's getting rid of the heat as fast as possible," Deacon explained. "So if you don't keep pumping heat into the system, it'll shut itself down. In fact, self-organizing systems destroy the conditions that enable them as fast as possible." Deacon described a theoretical process called "autogenesis" which has the ability to create, preserve and reproduce order — the distinctive features of living organisms. This process is effectively comprised of two sub processes: reciprocal catalysis and self assembly. A catalyst is something that speeds up a chemical reaction, and reciprocal catalysis means that two or more catalysts each contribute to the synthesis of each other. Some of the energy gets transferred from the initial molecule to the next, and this goes on to break up another molecule, in turn passing on the energy. "It's a you scratch my back I scratch your back kind of relationship," Deacon said. "Almost all of the chemistry in living cells has this kind of circularity." The famous Martian meteorite ALH 84001 contains a "fossil" that was ruled out as life because of its small size; however, it could still be an autocell — a precursor to life. Spontaneous self assembly can occur because some molecules fit together easily in a symmetric manner. This can happen within cells to create microtubules. "Microtubules are kind of like the skeleton of a cell but they're also kind of the roadways inside a cell that molecules travel along," Deacon said. Reciprocal catalysis and self assembly give each other a helping hand as each produces what the other one needs, so they give each other a helping hand. Reciprocal catalysis produces a local concentration of molecules, but without anything to keep them in place, they will soon wander so far apart that they will no longer be able interact. However, the local concentration of molecules is just what self assembly needs to build a barrier around the catalysts, thus encapsulating them. "The very thing that you need to do to keep these independent catalysts together is what they produce as a consequence," said Deacon. "The result is that containers contain the stuff that is necessary to make them." If the container surrounding the catalysts becomes shattered, the catalysts will spill out. All is not lost, however, because they will just create another container for themselves. If the catalysts spread apart a little after the breakage, it's possible that multiple systems could then be created meaning they can effectively "reproduce". Nonetheless, the work cycle is similar to what living things can do. They have the ability to create order and then stop it from degrading, instead capturing the conditions needed to recreate itself. Deacon emphasizes that, in our search for life elsewhere in the Cosmos, we need to stop thinking about how life was created on Earth, and the specific molecules needed, and instead focus our attention on the general principles involved in the creation of life. The catalysts could form enough molecules that self assembly occurs, creating a barrier around the catalysts so that they don't disperse. As the autocells repeatedly break apart and reform, they have the chance to sample their environment. If one of the autocells captures a catalyst that functions better than the others, it will produce more of these proactive catalysts, allowing a limited form of evolution. If this hypothetical molecule was actually something like a nucleotide, then it could also grab energy from the environment by capturing additional phosphates. This extra energy would speed up the system. However, high energy phosphates can hinder the system as it could break it apart completely. By grouping these energetic molecules into polymers, it is possible to store the energy when it is not being used. A huge problem lies in the fact that the autogenic process is unlikely to start on a planet such as the prebiotic Earth, as the polymers needed for life will break down in water. However, if we take our chemistry experiment to a gas giant like Jupiter, the high levels of methane and ammonia will produce hydrogen cyanide polymers. These polymers can only be produced in environments without water and have a "backbone" identical to proteins, but with different side chains. These are called polyamidines. If these polyamidines hitched a ride to the Earth in earlier epochs when the Earth was being bombarded by outer solar system material, they would come into contact with water. However, these particular polymers will resist being broken down for some time. Instead, they replace their side chains with the carbohydrates characteristic of proteins. In this way, they create partial proteins, and this might be a way that autogenesis based on proteins began on the early Earth. The inner planets also have the advantage of containing phosphorous, sulfur and iron, which are unavailable in the outer planets, and these metals speed up catalysis. Deacon is adamant that whole solar systems are needed to generate life, not just terrestrial planets with water. Life probably needs a solar system similar to our own to start, although autogenic processes could still occur in a system that only has gas giants. The size of Earth compared to the gas giant Jupiter. The autogenic process is unlikely to start on a watery planet like Earth, but the high levels of methane and ammonia of Jupiter could produce the needed hydrogen cyanide polymers. He also raised an interesting point regarding the ALH 84001 Martian meteorite, which initially excited scientists by appearing to contain fossilized microbes. This possibility was later ruled out by most people, partly because the structures are thought to be too small. However the size and structure are what is expected from an autocell, so this meteorite could be showing us a fossilized precursor for life. Deacon believes that autogenesis could have occurred on Mars before Earth, but only our planet had the right conditions in the long term for this to lead to life. Even in an alternate theory on life's origins, where it is suggested that life began with the "RNA world", there is evidence that life on Earth could not have started without the other planets. Stephen Benner presented an idea at the Goldschmidt conference in August that the conditions on the prehistoric Earth would only have served to inhibit the formation of RNA. Mars, on the other hand, would have been just right. While there was some water on ancient Mars, there wouldn't have been enough to hamper the formation of RNA. Also, while the early Earth was starved of oxygen, Mars would have had enough to create oxidized molybdenum and boron, which are pivotal in the construction of RNA. Autogenic forms are probably more widespread than life in the universe as they can be constructed from many different materials. It's a generic type of chemistry which may be similar throughout the universe, indicating that the process is more important that than the molecules themselves.